aside from baxter hurting his wee little leg yesterday (it's not broken and is getting better all the time and, not too worry, he's getting full convalescent treatment - half the kitchen is a comfy pile of wool blankets with chewy treats, food and water right beside plus he got to sleep with us allllllll night), i've been having a lovely week. my much awaited jen corace letterpress prints arrived from mahar dry goods the other day and are just simply wonderful, even more beautiful in person than i expected (i bought these with the money you put in my canadian account for christmas, mom, so thanks for the lovely gift!). and, since i'm waiting for the pendants to be ready, i had a spur of the moment decision to relaunch the line of cards i designed in canada a few years ago. i came across a stack of them while i was cleaning up over christmas, plus leftover card stock, envelopes and cellophane bags to pack them in. it would be crazy not to use this stuff up, i figure, and i do enjoy making them so. here's a sneak peek, i'll be adding them to my esty shop tomorrow. 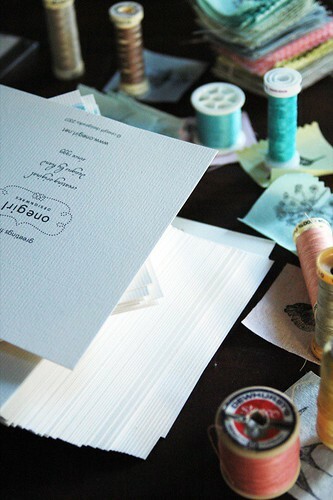 love your jen corace prints. looking forward to seeing the new pendants and the cards. hope baxter is feeling better. hey the cards are really cute! i hope they sell well. tis great when you can use up leftover materials. 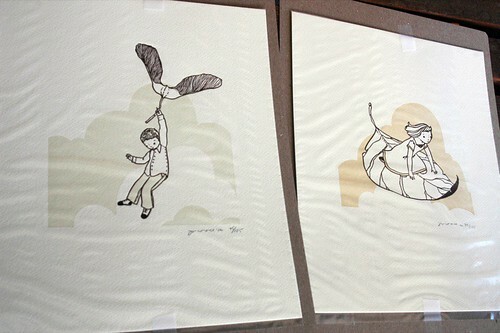 the jen corace prints are aresome also. i'm so jealous. just been looking through your delightful blog and found this post - and i have the exact same prints!i bought them years ago thinking i would use them in a nursery but they adorn our bedroom and i love them so.